Confirmation that Iran has joined the air campaign against Islamic State (IS) terrorists in Syria won muted praise from U.S. officials last week. 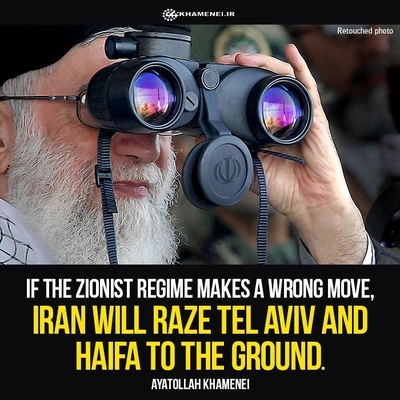 And that development has increased anxiety among Israeli defense officials that budding cooperation between Tehran and Washington will lead to dangerous comprises about Iran's nuclear program and inadequate action confronting the Islamic Republic's global terrorist network. The biggest threat from that network lies just over Israel's northern border in Lebanon. On Sunday, according to international media reports, Israeli Air Force jets bombed targets in and around Damascus. The strikes likely targeted advanced weapons that were destined for Hizballah depots in southern Lebanon, often hidden in apartment buildings in Shi'ite villages. With more than 100,000 rockets and missiles, Hizballah has the largest arsenal of any terrorist organization in the world, and its heavy involvement in the Syrian civil war on behalf of dictator Bashar al-Assad's regime is giving it plenty of experience in ground warfare. Israel did not confirm any involvement in the recent air strikes, but it is deeply involved in a covert war against an international Iranian-led weapons smuggling network that is designed to provide Hizballah and other radical terror entities around the Middle East with an array of sophisticated arms. This network is run by Iran's Revolutionary Guard Corps' Quds Force, which oversees the smuggling of powerful weapons to Hizballah in Lebanon, often via Syria. The Iranian network also attempts to send arms to Hamas and Islamic Jihad in Gaza, to radical Shi'ite militias in Iraq that fight the Islamic State, and to Shi'ite Houthi rebels that have taken over Yemen's capital. Iran's Quds Force and Hizballah, both backers of the Assad regime, have set up terrorism sleeper cells around the Middle East and beyond, according to Israeli intelligence assessments. Some of these cells are routinely activated and ordered to strike Israeli and Jewish targets. Israeli intelligence agencies quietly work to stop the planned attacks, any one of which, if successful, could spark a wider regional conflict. Meanwhile, Tehran continues to pursue a nuclear program and develop ballistic missiles capable of carrying nuclear warheads. According to international media reports, Israel targeted shipments of Hizballah-bound weapons in Syria five times in 2013, and once in Lebanon in 2014. This has led Hizballah to retaliate by planting two bombs on the Israeli-Lebanese border. Defense Minister Moshe Ya'alon appeared to hint at Israel's role in the latest Syria strikes, by saying that "those who seek to arm Israel's enemies will know that we can reach anywhere, at any time, and through any means to thwart their plans." As this covert, high-stakes struggle continues to rage against the background of Iran's creeping nuclear program, a growing number of Israeli defense officials are expressing concern that the Obama administration may be willing to cooperate with Iran and its radical Shi'ite allies in the war against the Islamic State. The officials stress the flourishing defense ties between Israel and the U.S., which are absolutely vital for Israeli security, and express gratitude for continuous American defense assistance. However, some have become highly critical of the way the U.S.-led coalition against the Islamic State sees Iran as a de facto member. Israeli defense officials wonder out loud whether the West, led by the U.S., is falling into a dangerous trap, by teaming up with the radical Shi'ite axis in the Middle East. To be sure, no one within the Israeli defense establishment doubts the need to tackle the Sunni Islamic State. Israel is quietly providing any assistance necessary to the anti-ISIL coalition. Yet it is the prospect of tactical cooperation between the U.S. and Iran against IS, and the danger that the cooperation could lead to Western concessions to Iran over its nuclear program that haunts some. The failure by Washington to take tangible steps against Iran's global terrorism network is also a source of concern. This network is growing in Syria, along with Iran's presence there, and over the past 12 months, all of the cross-border terror attacks launched from Syria into northern Israel have been the work of elements linked to either Hezbollah or Iran, one senior military official has said. These worries seem to be bolstered by comments like those recently made by Secretary of State John Kerry, who welcomed Iranian air strikes on Islamic State positions in Iraq, describing them as "positive." Unlike the Islamic State, the Shi'ite radical axis enjoys state sponsorship from an Islamic Republic that is three to six months away from nuclear weapons. This situation makes it a more urgent problem for global security, and would seem to justify a stance that views both radical Sunnis and radical Shi'ites as threats to international peace. Driven by an extremist religious-ideological doctrine, the Iranian-led axis views moderate Sunni governments which partner with the West – like Egypt and Jordan – as enemies, seeks to push American influence out of the Middle East, and promotes the idea of Iranian hegemony as a first step to establishing eventual Iranian global dominance. Iran views itself as the authentic Islamic caliphate, and seeks to export its influence as far as possible. Eventually, it would like to fuel conflict across the region through its proxies under a nuclear umbrella. "The success of the Iranian revolution influences to this day the ambition for an Islamic caliphate," Ya'alon said this month, in an attempt to illustrate the imminent danger posed by Iran's role in the world. Disappointment in Israel has been expressed over what one official said was the West's "support" for radical Shi'ites, and its willingness to ignore Iranian threats. Israeli officials, led by Prime Minister Benjamin Netanyahu, have expressed concern about the U.S. agreeing to a "bad deal" with Iran over its nuclear program since talks started. Thus far, those fears have not yet been realized. The Tel Aviv-based Meir Amit Intelligence and Terrorism Information Center published a report last week that explicitly warned about Iranian-American cooperation against IS, which it said could occur at Israel's expense. "Despite Iran's basic hostility towards the United States, and despite Iran's subversion of American interests in the Middle East, it might collaborate with the United States against ISIS and the global jihad in Syria and Iraq, the common enemy," the report said. "Such collaboration might occur at Israel's expense and harm its vital interests (for example, Iran's concessions on the nuclear issue). In addition, collaborating against ISIS might increase Iranian influence in Syria and Iraq, and might also strengthen Hizballah's status in Lebanon, possibly strengthening the Iranian-led radical camp in the Middle East." The report is another signal of concerns in Jerusalem that Washington's war on IS could lead it to make concessions to Tehran on a nuclear program. Such an outcome would entrench and legitimize Iran's position as a state on the threshold of nuclear arms possession, an outcome that, in Jerusalem's eyes, would jeopardize both regional and international security to an unacceptable degree. I hear what Mr Lappin says about the Iranians goal of re-establishing an Islamic 'Haliphate. Though they might say they wish, I disagree it is their intention. Being Shiya they would need to rule over the Sunni majority with a bloody iron hand, and they would be constantly at war within own dominion. It would not work, and they know it. They really want a Shiya empire, with its islands of influence not contiguous and influencing events by way of projecting mayhem. The Bomb, of which the Israelis are rightly so fearful, is really a means to project intimidation, not for actual use. It is, in my opinion, a means to instill fear into the hearts of the Sunni leaders they consider a threat to their own survival as a Mullah-Shiya-State, mainly the Sa'udis. IS claims to want a 'Haliphate also, perhaps aspiring to rule over the Shiya though I doubt the latter, from the same considerations. What is confusing is that the IS has both support and enmity in Sa'udiya. Factionalism is rampant in the Arab world, hence this is not surprising, as tribal interests predominate masquerading as religious convictions. The US may have strategists that understand the complexities, the eternal instabilities, as Gen Petreus revealed to US minds in his successful emulation of policies and rulers from time immemorial. However, I doubt their influence is great. The US is also not united with one mind and one strategy. Indeed it is struggling with strategy. Perhaps a review of the Roman and British policies and tactics of divide and conquer might be in order. Essential is the creation of a cadre of Americans with deep and current knowledge of tribes, their cultures, aspirations, leaders and upcomers. The recent revelations of torture by interrogators not knowing the targets' language and customs made me aghast. This is NOT professionalism. Perhaps it is time the wise heads in WDC learned the ways of the Israeli intelligence services. Do I dare suggest that the American services learn to farm out to Israelis?